FIU professors Brian Latell and Jonathan Rosen have released books on Fidel Castro and the future of U.S.-Cuba relations. As the world continues to react to the passing of Cuban dictator Fidel Castro, two professors from the Steven J. Green School of International and Public Affairs, Brian Latell and Jonathan Rosen, recently released books on Cuba – both tackling Fidel Castro’s legacy and the future of U.S-Cuban relations. Latell, a former CIA analyst who tracked Castro for decades and is now an adjunct professor at the Jack D. Gordon Institute for Public Policy, released his book, History Will Absolve Me: Fidel Castro: Life and Legacy, on Nov. 25 – just hours after Castro’s death was announced. As a CIA analyst, Latell was assigned to Fidel Castro in the 1960s and tracked the movements of the unpredictable revolutionary leader for more than 35 years – getting to know the fears and passions that drove him. In his book, Latell reveals the motivations of one of the most complex leaders of the 20th century, including his own thoughts on Castro over the years. 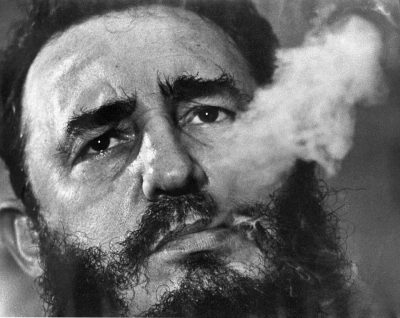 “History will absolve me” was Castro’s own line,’’ said Latell, referring to the title of his book. “He used it in his trial defense back in 1953. Latell is also author of After Fidel: Raul Castro and the Future of Cuba’s Revolution, which has been published in eight languages around the world, as well as Castro’s Secrets: Cuban Intelligence, the CIA, and the Assassination of John F. Kennedy. When President Obama and Raul Castro announced a new course to normalize diplomatic and trade relations between the United States and Cuba in 2014, Rosen, a research scientist at the Gordon Institute, began writing his book on Cuba. A collaboration with Hanna Kassab, visiting professor at Northern Michigan University, U.S.-Cuba Relations: Charting a New Path was released shortly before Castro’s death and examines the history of U.S. policy toward Cuba, focusing on critical junctures and recent strategic shifts. “My co-author and I were working on a book on the Obama Doctrine in America,” Rosen said. “Several months into working on this volume, President Obama made his announcement about a shift in U.S.-Cuba relations. For Rosen, this is his first book on Cuba. “The authors have done a remarkable job at providing historical accuracy and strategic insight into U.S.‐Cuba relations. With masterful clarity, attention to details, and a hopeful tone, this book is truly a rare gem for scholars and anyone who aims to grasp the complex history and evolving relationship between the United States and Cuba. Both authors, when asked to comment on the future of U.S-Cuba relations under a Trump administration, said the question was tough, as the president-elect has not been clear about his views on Cuba. Rosen admitted he is not optimistic. Brian Latell will discuss his book at a presentation sponsored by the Kimberly Green Latin American and Caribbean Center, the Cuban Research Institute and the Gordon Institute at 2 p.m. on Jan. 25 at the Green Library. Click here to RSVP.